The adsense have released a new ad format, smaller than its current 300×300. Great addition given how difficult it is to design well balanced pages. 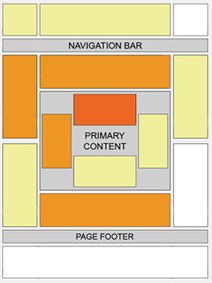 but the narrower 200×200 will allow better design of pages. The smaller format should allow a better fit into a pages natural hot areas as shown below. The graph shows the best performing locations for adsense; dark orange is the strongest performance location, while to light yellow is the weakest performance. Naturally, ad placements above the fold tend to perform better than those below the fold. Ads placed near rich content and navigational aids usually do well because users are focused on those areas of a page. But nothing beats trial and error with web analytics of user behaviour.